A drink-driver who crashed into the rear of another vehicle and drove off has narrowly been spared from being sent to jail. Chesterfield magistrates’ court heard on Tuesday, July 11, how Ruth Claire Hodgkinson, 40, of Compass Crescent, Old Whittington, Chesterfield, collided with another vehicle on High Street, at Old Whittington, before driving home. 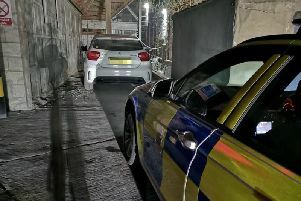 However, prosecuting solicitor Becky Allsop said the driver of the other vehicle followed Hodgkinson and confronted her at her home after spotting her vehicle parked on her drive. Mrs Allsop said: “It was just before midnight when the complainant was driving on High Street when another vehicle drove into the back of him. “As he pulled over the car driven by the defendant pulled over and then drove off. He followed her and the vehicle was parked on her drive. Hodgkinson told police she had been to her ex’s address and had intended to stay and she had drunk a bottle of wine and had a couple of drags from a cannabis joint. She said she only has flashes of driving home and only vaguely remembers the collision but not the details. The defendant registered 123microgrammes of alcohol in 100millilitres of breath when the legal limit is 35microgrammes. She pleaded guilty to exceeding the alcohol-drink drive limit and admitted failing to stop after the accident on June 13. The complainant claimed that he and his passenger both suffered whiplash and that his newly-purchased car may need an estimated £4,000 of repairs or it could be written-off. Magistrates sentenced Hodgkinson to 17 weeks of custody suspended for 12 months with an eight-week curfew and 100 hours of unpaid work. She was also banned from driving for 30 months and ordered to pay £85 costs and a £115 victim surcharge.